A properly designed night cover will save you money and protect your perishable foods. Your stores night crew just needs to pull down the blinds during closed hours to create a barrier between the merchandise and circulating ambient air in the store. The savings from a night cover installation are significant, especially when you factor in additional benefits like increased food safety and reduced product shrink. A night cover that has been specifically designed for retail-food applications will result in energy savings and further cost savings throughout its lifespan. In most instances a top quality night cover will last up to ten years and withstand the rigors of daily use and deliver a payback on your investment in under two years! As both smaller stores and national chains seek ways to reduce their environmental footprint and communicate their message of saving energy to their customer, the retrofit night cover has become one of the most practical and efficent means to achieve this. 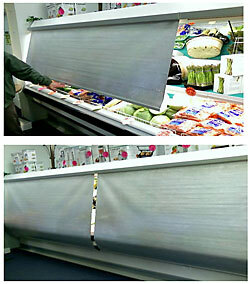 Retailers are proud to showcase that they have installed retractable night covers on their refrigerated display. You too, will be more than happy to share the news about how installing night covers on your cases enabled you to save energy. How they helped dramatically reduce the amount of discarded merchandise in each of your departments and help communicate your efforts in making your store a healthier more eco-conscious business. Night covers will improve departments profit margin and continue to meet a strict level of food safety and quality control. Retrofit night covers dramatically reduce the amount of product shrink (spoiled merchandise that is discarded because of damage caused by ambient air and uv light). The dollar value of this discarded merchandise represents billions of dollars annually in the retail-food industry. The greatest gains are realized in produce, meat, dairy and packaged deli departments. Night covers will slash the amount of energy and time devoted to the trimming and maintenance of product displays each day. Installing night covers will save you energy, however more importantly they will also protect your valuable merchandise from the damaging effects of ambient air and uv which can quickly wilt, discolor, or promote bacteria growth. A top quality night cover is designed to conserve energy and provide retailers with an effective and affordable way of surpassing the objectives and challenges within todays retail environment. For more information on Econofrost retrofit night covers. With over 30 years of experience in the night cover industry and with thousands of installations world-wide their extensive knowledge of refrigeration systems, supermarket procedures and food safe intiatives ensures you will achieve your energy saving objectives. You can be confident that you are investing in a retrofit application that fits your store needs and budget!